So what can I possibly say about this decadent dessert? I think the name itself speaks volumes. First of all, I love chocolate chips cookies. I mean, really, really love them. And then there’s cookie dough. Well, I know I’m not the only one who’s purchased a package of dough with the intention of making chocolate chips cookie, only to eat spoonful after spoonful… even though it’s considered “risky” because of the raw eggs. The good news about this recipe is that you don’t have to worry about salmonella as the cookie dough doesn’t contain any eggs!! Woo hoo! Okay, next up is cheesecake. Simply put, I can’t get enough of it! 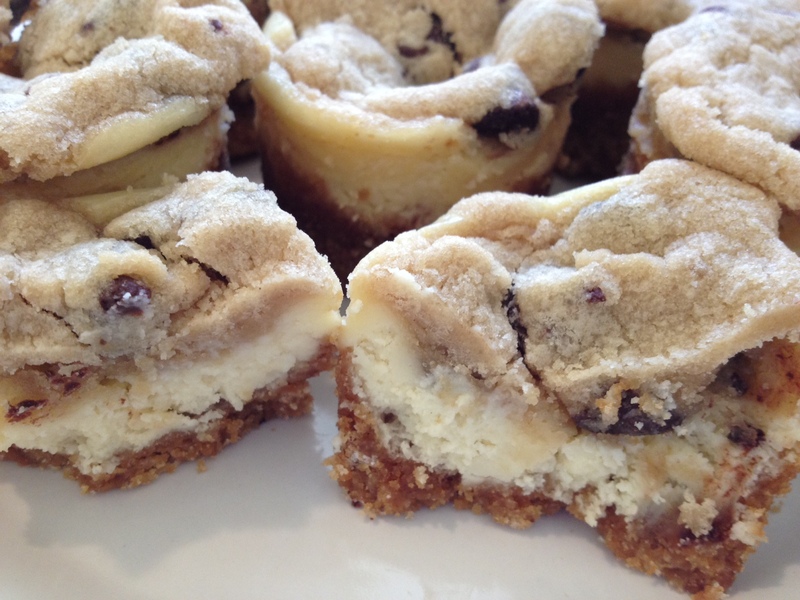 And the combination of cookie dough and cheesecake together, is like a little slice of heaven! I highly recommend you try this recipe if you adore all of the above as much as I do! Preheat the oven to 325 F. Spray mini-cheesecake pan with cooking spray (you can also use a muffin pan with cupcake liners). Set aside. Mix the melted butter, sugar and graham cracker crumbs until thoroughly combined. Press the mixture into the bottom and going up the sides of the prepared pan. Bake in preheated oven for 6 minutes. Remove pan to a cooling rack. Leave your oven on while you prepare the dough. While the crust is cooling, prepare the chocolate chip cookie dough. In a large bowl with an electric mixer, beat butter, brown sugar, granulated sugar, salt and vanilla until smooth and thoroughly combined, about 1 minute. Stir in the flour a little bit at a time, on low-speed, and mix until just incorporated. Add the chocolate chips and blend in with a spoon. Set aside. In another bowl, using a mixer, cream together the cream cheese and sugar until smooth. Mix in the egg and vanilla on low-speed just until incorporated. Pour the cheesecake batter into the prepared crust. Using your hand, form round teaspoon-sized clumps, and distribute the cookie dough onto the top of the cheesecake batter. Bake for about 25 minutes, until the top (cookie dough) feels dry. Since cooking times vary with different ovens, I’d recommend checking them at 20 minutes. Chill in refrigerator overnight or for at least a couple of hours. * If you’re not familiar with mini-cheesecake pans, they’re basically like muffin pans except the cups are thinner and taller, and there are holes in the bottom. They come with small, round discs which lay in the bottom, on top of the circular holes, so you can push up the bottom with your finger or the end of a wooden spoon to get a nice looking mini-cheesecake. I recently bought one of these pans from Amazon made my Chicago Metallics that cost about $13. 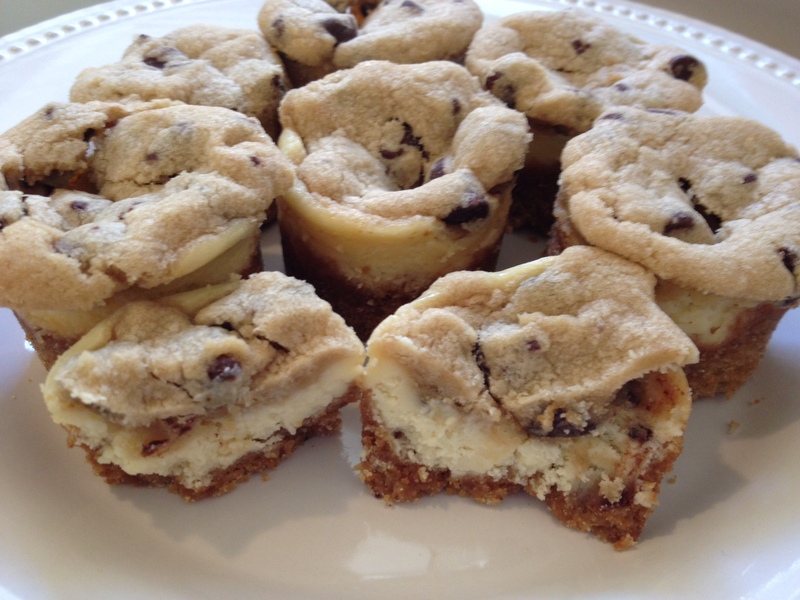 This entry was posted in Desserts, Recipes and tagged bite-size, cheesecake, chocolate chip, cookie dough, dessert, graham crackers, mini. Bookmark the permalink. Could I made these in a regular muffin tin? Angelica, yes, these can definitely made in a regular muffin tin! Do you think ‘Mama’s gluten free almond flour’ would turn out in these? Instead of flour? Annie, I’ve never used gluten free flour, but you can substitute it instead of regular flour. However, you will need to add Xanthan gum or Guar gum. It does the job that the gluten would do, it holds it together and keeps its place. You can get this at most health food stores, and some larger stores carry it as well. You use 1/2 tsp of guar or xanthan gum per cup of flour used, so in this recipe, you’d use 1/4 tsp. Hope that helps! My daughter made these and was nice enough to share, sooooo yummy! I’m so glad your daughter shared them with you, and you enjoyed them!!! Could I use store bought cookie dough? I wouldn’t recommend it. As I wrote above, this cookie dough doesn’t contain eggs, which is safe to eat and also doesn’t allow the dough to truly form into a cookie when baking. If you use store-bought cookie dough, it will bake into a cookie, thus losing the dough-ish flavor. They are so good! Let me know if you try them! Just made these, boy are they yummy! Very easy to follow recipe and they turn out perfect! Thank you so much for posting this. Joanna, I’m so happy they turned out great and that the recipe is easy to follow 🙂 You’re welcome… I’m always happy to share the deliciousness! Mica, sorry I didn’t include servings when I posted this. I combined a couple of recipes, one of which was for bars, which served 9-12, but if I remember correctly, I filled up my entire mini-cheesecake pan which makes a dozen. Could I do this in layers like in an 8×8 pan or double it in a 9×13 pans and cut into bars? Krista, by all means you can do these as bars!!! That would cut down on prep time, too! Josie, I don’t know why yours turned out hard, but can tell you that the cookie dough does cook a bit so doesn’t have the traditional cookie dough consistency you’d get from store-bought prior to baking, but should taste like cookie dough. I baked them for the full 25min. Do you think I should cut down on the baking time? Thank you for you quick response. Different ovens can have varying cooking/baking times, so yes, I’d recommend shortening the time you bake them (I wrote that in my directions.. see #6). I have an antique stove, so always have to check whatever I put in the oven to make sure it’s not overcooked. Just keep in mind the cookie dough should feel dry. I only have mini chocolate chips. Should I still use 2/3 c., or should I use more or less? Sorry I wasn’t able to respond sooner, but I’m sure it’ll be great. Cooking/baking is all about modifications, and the amount of the chocolate chips you use, won’t make or break the recipe… it’s really the other ingredients that are more important. I hope you enjoy them! I made these today, they were easy to make, and came out so well. Everyone loves them. I posted on FB with a link back here. Thank you for the recipe. You can definitely make these today and have them on Christmas. Cheesecake can be stored in the fridge for 5-6 days safely. can we use our own cheesecake recipe in lieu of the one you posted ? the recipe i like calls for marscapone which ive sworn by for years now. Most definitely use your favorite recipe in lieu of the one I’ve posted here! How would cook times vary if I use a mini muffin pan, instead of regular size muffin pan? Or, is that not recommended? Thanks!